Rhona and her paladin brother, Alastar, belong to a holy people who have waged war on witches and warlocks and their clans from the highlands. But when she uses magic to save his life, their world is thrown upside down. On the run, having left all they knew behind, they have to rely on those who hate Paladins. All magic is evil, the High Paladin taught... but Alastar starts to understand that he might have been mislead. If his sister uses magic, and she isn't evil... what does that mean for his beliefs? Brother and sister soon find themselves aligned with magic users and thrown in with the clans in a war against sorcerers and paladins alike, with only one hope of uniting the land - the legendary Sword of Light. It was lost years ago, and quest after quest by the holy paladins could not retrieve it. When you know the truth about magic... anything is possible. 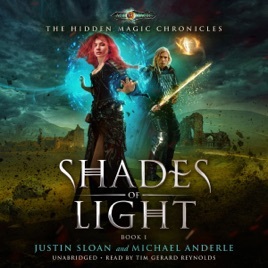 Set on the foundation laid by the Kurtherian Gambit Series, Shades of Light tells an entirely new story in the Age of Magic - and of the heroes and villains who battle for control of its destiny.